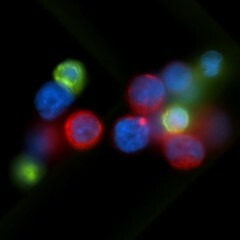 This cluster of circulating tumor cells (CTCs, shown in red) and white blood cells (shown in green) originated from the blood of a breast cancer patient. CTCs are an important focus of cancer research because they provide a key target for new treatments. By identifying the molecular adaptations and genetic mutations that allow CTCs to metastasize, or establish new deadly tumors throughout the body, researchers hope to facilitate the development of strategies for blocking metastatic cancer on a patient-by-patient basis, ultimately saving lives.